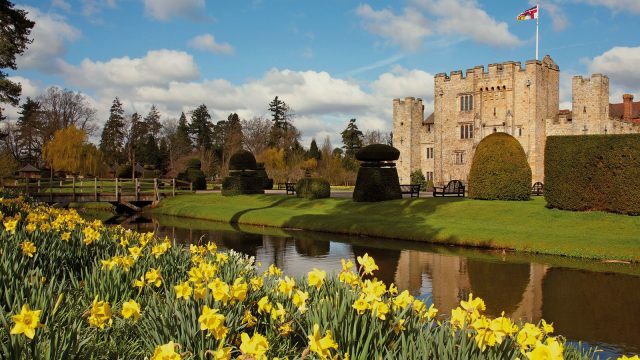 Jump to Hever Castle prices for 2019 (below). Usually, there are two types of ticket available: Castle & Gardens and Gardens Only. Tickets can be purchased on admission or online. Savings can be made by booking online but online tickets cannot be purchased on the day of your visit. Entrance to most attractions is included in all ticket prices, but please note that Boating, Archery and Shield Painting are NOT included and not available all year round. Most events are included in ticket prices with the exception of special ticketed events, such as Father Christmas and Twilight Christmas events and those that are operated by third parties. Please note that some activities that take place on event days are chargeable and any activities that take place in the Castle require a Castle & Gardens ticket. Please note – children under 15 cannot enter the Castle unless accompanied by an adult – visitors 15 years and over can enter the Castle unattended if they have a valid adult Castle & Gardens ticket. Group ticket prices and School Trip prices are also available. Armed Forces discounts are available at certain times of the year. More information can be found here. Details of partner offers with the RHS, Historic Houses, Gardeners’ World, Tesco and Visit Kent are listed here.